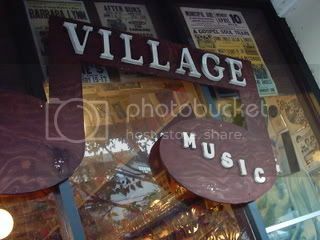 "Mill Valley the In Town of Marin Towns"
Like the Phoenix, music lives another life in the musical hamlet Mill Valley. 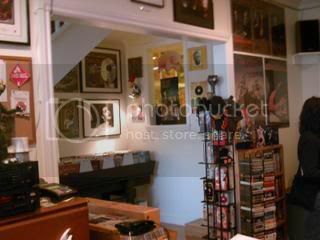 Defying all well intentioned discouragement Gary opened a retro record shop in this ituney digital time of ours. 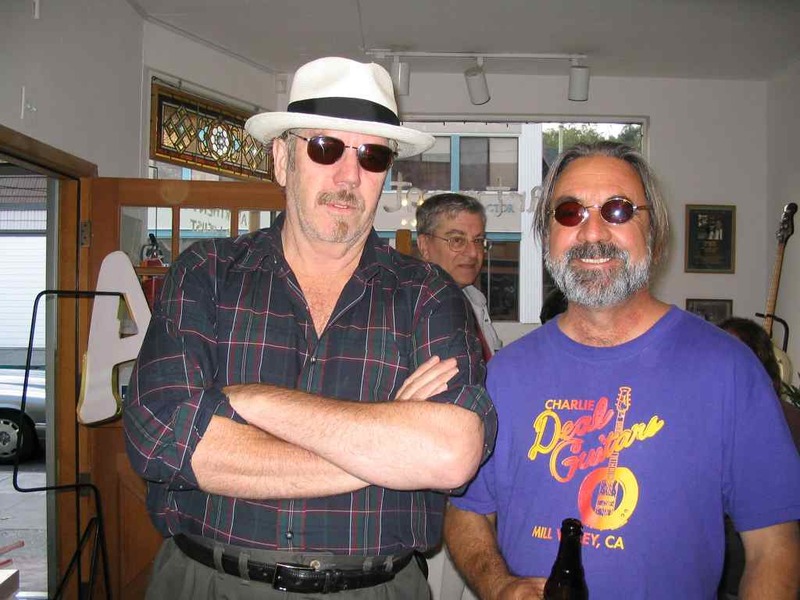 Gary Scheuenstuhl knows what he's doing his twenty five years with Village Music has generated a mountain of good will, friendships, and experience that could make his Mill Valley Music legendary in time. Gary is interested in building a store that encourages walk in customers to browse and chat. 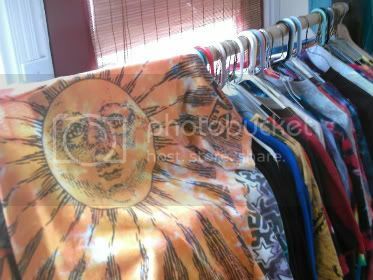 In addition to being a vinyl broker (LPs, EPs, 45s) Gary sells and buys used CDs, Jerry Garcia ties, collectables, T shirts, posters, DVDs, VHS, guitar strings, and pics . . . he's open to suggestions (kazoos & harmonica racks). There is a cool loft upstairs with a fire place . . . some times there's a jam sesson going on. Gary is personable and informative . . . an all around great guy . . . tell Gary, "Captain Wayne-O sent you". Charlie Deal, you live in our hearts. After the summer of 2007 Mill Valley just won't be the same. For years the youthful and affluent shiny bimmer drivers and their ilk have been displacing the working class bohemes, teachers, cops, firemen, small business owners, hippies, other local yokles, and faithful almost middle income transplants such as myself. Landmarks of the old school; Village Music, the Sweetwater Saloon, and the much newer yet locally rooted Apartment A are not likely to see the light of 2008. 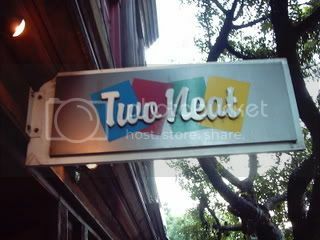 These establishments were my favorites and have been featured often on RanchoBozo.com. Yet fortunately there is a little light at the end of the tunnel and some hope that like minded souls will prevail with new businesses. 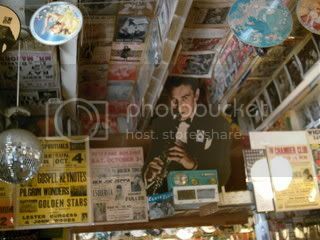 Gary Scheuenstuhl's new record collector's/musician's emporium; Mill Valley Music located at 320 Miller Street, mid town Mill Valley. 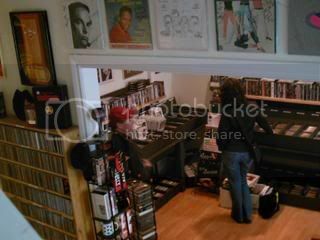 Gary is quite a collector and a working musician (a drummer). 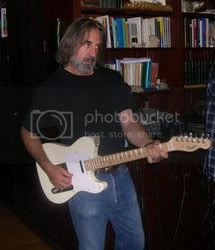 Gary worked part time for years with John Goddar at Village Music. With not a speck of doubt Gary is the natural person to receive the local record store torch. Thank you Gary. 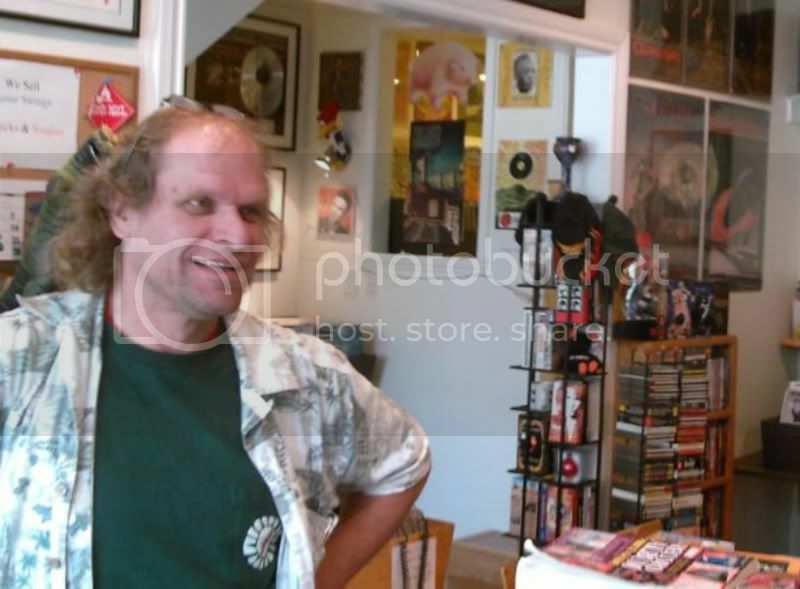 Thank you John for raising the quality of life and hipness in Mill Valley by having it home to Village Music, the Best record store the world. I loved showing off Village Music, Muir Beach/Woods, the Golden Gate Bridge, and the Sweetwater to my friends and relatives through out the years. I spoke to John the other day and he mentioned that he intends to keep his Village Music website up and running, Thanks John . 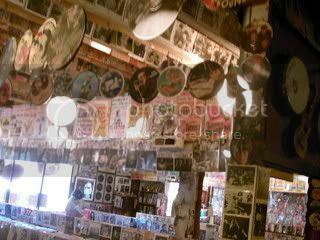 . . you'll always be a part of all our record collections. 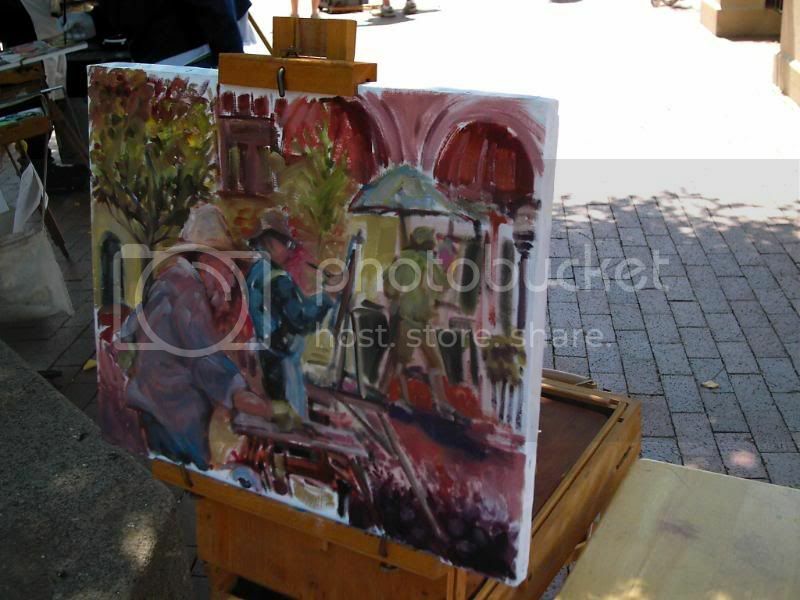 Look here for a photo essay on Mill Valley Music. There's been many close calls and compromises but this is it folks . . . the shepherd boy gets eat'n . . . It's appropriate that Mr. Sweetwater H. Open-mic himself Audie deLone sing a video send off . 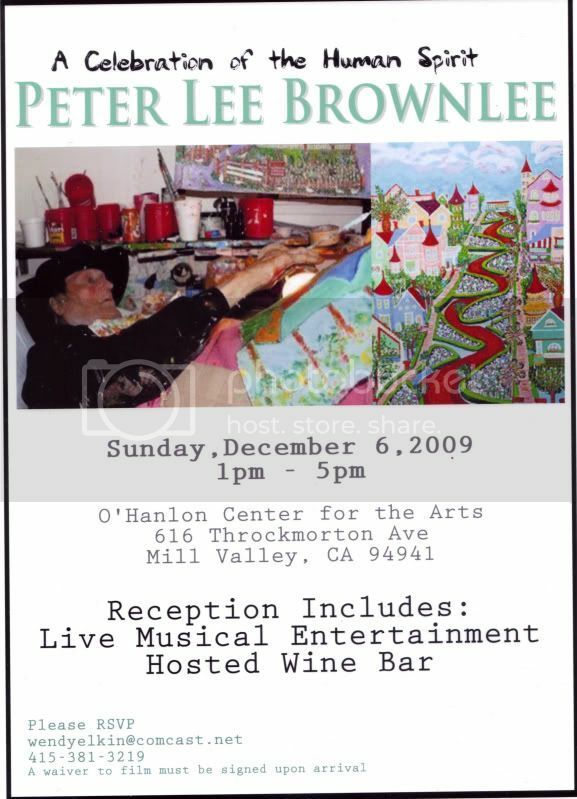 . . and let's face it you can't expect great musicians to play for nothing and you can't expect to do that with out a reasonable cover charge and you can't expect that happen without a loyal door man like my old friend Brent Alan (host of the televison show Marin Tonight) . . . saying good by to the Sweetwater . . . 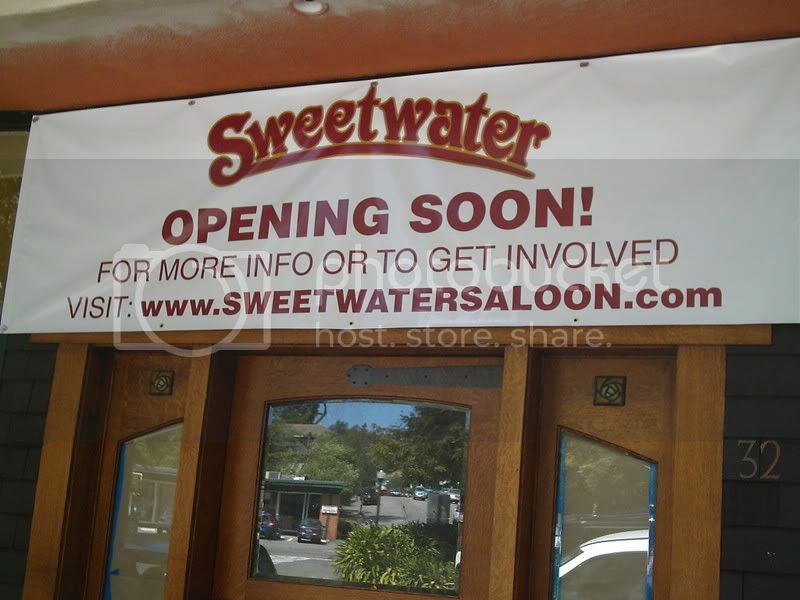 The Sweetwater Saloon closed their doors in the fall of 2007. Tom and Becky are preparing to open a new Sweetwater around the corner on Miller some time in March er June of 2008. I'll keep you posted. The fifty sixth year rolled on this fateful summer of 2007 for our dear Captain. I loved the last one so much fate would bring me one just the same but even better. Sophie at the Taco Lounge new exactly what I wanted . . . a grilled snappper burrito no rice extra celentro and grilled to perfection . . . no beer for the Captain this time around. 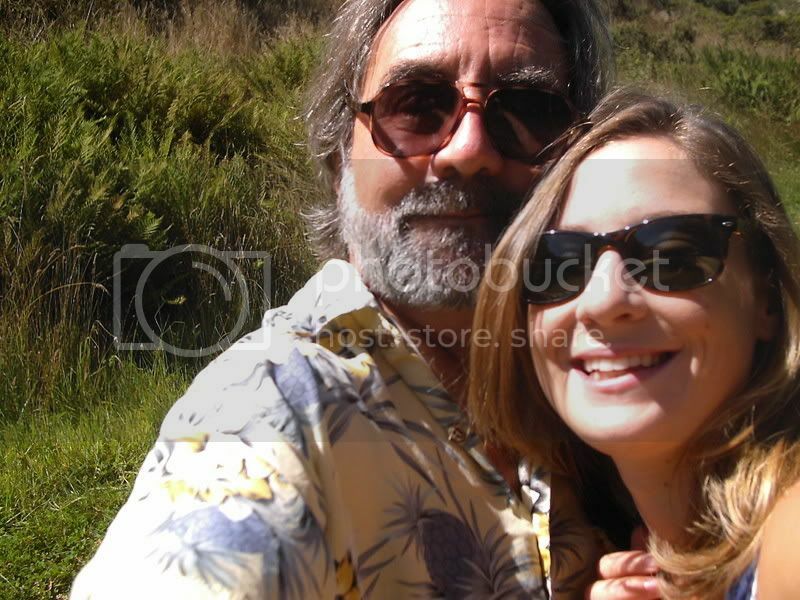 Genna was the best and even picked up the tab for dear old dad. Click here for our extended arm self portrait at Tennesee Valley 2007. It rolled around and it was a great one. If you're fifty five you qualify for a ten to twenty percent discount on some day of the week at some retail outlet. There's always the early bird specials, discounts to the movies, come to think of it everybody's offering breaks to us seniors. Let's not forget that for years the national speed limit was 55. What U.S. president repealed the 55 mile per hour speed limit? Why? As luck would have it my daughter Genevieve is visiting us on my birthday. 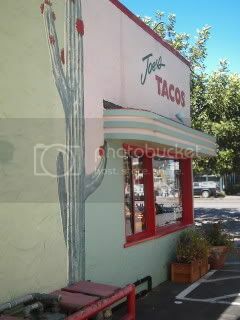 We had healthy and delicious tacos and burritos washed down with refreshing Mexican beer at Mill Valley's world premire taco lounge; Joe's Taco Lounge. Genevieve and I took a hike in one of our favorite places Tennessee Valley in the farther reaches of our home Tam Valley. It's a perfect example of Californian golden rolling coastal hills. We had great conversations about everything. We laughed and made fun of everybody especially ourselves. A most excellent 55th birthday! 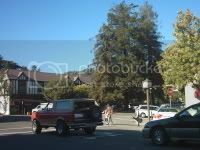 I think it's time for a pictorial tour of my hometown Mill Valley California. I guess there are a few people who will take a look at the pictures in this site and decide it's time to visit or worst yet move here. Well I moved here and if you want to move here go ahead. In fact tell all the locals at the 2am that Captain Wayne-O said it was totally cool with him. No wait tell them the Grantster said it was cool. I've taken a few pictures in and around town. I guess I'm stalling . . . if you want to see some really cool pictures check out Alan Nayer's photo essays link on below, OK? 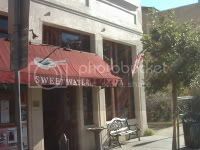 If you're in Mill Valley early on a Saturday afternoon stop in the Sweetwater and experience Bayside Jazz featuring Daniel I Hicks on vocals. I'll take a late lunch and see you there. It's cool it's free! It's Dan! (5/31/2004): See the making and maiden voyage of the Tamobile SEE the [VIDEO ~4.4MB] . . . hear the "Charlie Deal Memorial Day Toilet Seat Band"
Here's a cool link and a glimps of a great site by Alan Nayer MillValley94941.com (RIP) Now the Around the Town section can be seen on the Mill Valley Public Library website . 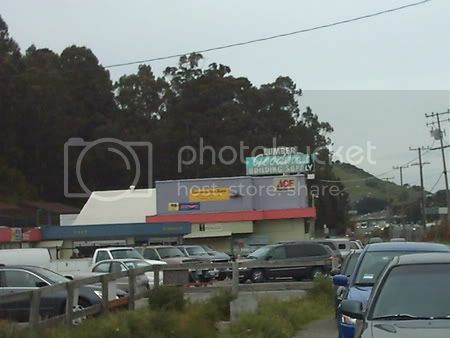 . . as an aside I changed my Mill Valley section from Around Town to In Town as a courtesy to Alan and 94941 woah . . . how do these things happen? man . . . .
Something about Mill Valley, something quite elusive. I have trouble finding words to describe it. I wish I could pin it down but I can't . . . .
. . . . . the lonely times spent waiting intensified to nearly unbearable. My itchy soles began to pretend to pace briskly as my palms chilled with thin sweat. My thoughts seemed to fold into themselves and leave jagged edges of intrusion. I knew I had to find away to hold my position and relax. 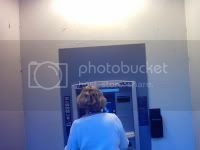 "That woman will eventually finish the transaction at this automatic banking device" I thundered the thought to a near audible range . . . . . So I guess one way we MARK TIME here at RanchoBozo.com is by yearly Dan Hicks and the Hot Licks shows that are show cased right here in Mill Valley's own 142 Throckmorton Theatre . . . these thematic shows continue through out the good ol' USA to bring Dan's many fans to their dancin' feet. This year is of particular interest to one unsung singin' suburbian cowboy . . . me. The show is "A Salute to the Singing Cowboys" featuring Dan Hicks and the Hot Licks performing live April 8th 2006. I'm on my way to buy my ticket now! I can only hope and pray I snag another original poster or maybe buy one. 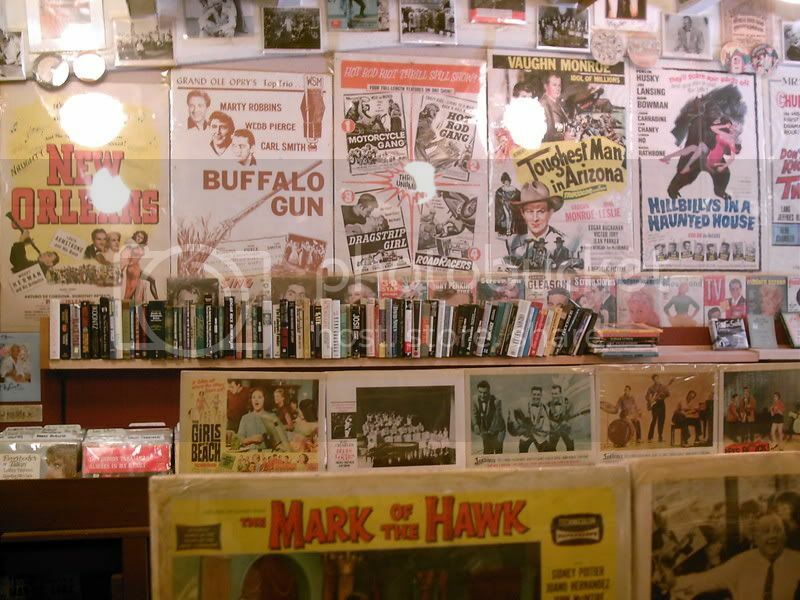 The idea of Dan as one of the singing cowboys harkens back to the wild western persona of the Charlatans and of course the famous cover of Original Recordings (to your left). 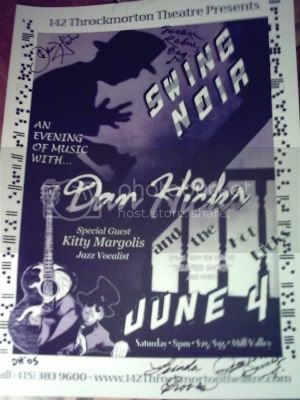 Well the year just rolled right along and Dan's hometown show June 4, 2005 mysteriously titled "Swing Noir" was richly satisfying. Dan designed a poster filled with criminal intrigue that harkens back to the cover of some yellowed copy of a "Police Gazzett" or "LA Confidential". The Hot Licks and Lickettes shined brilliantly and Dan's prolific patter was priceless. Mill Valley is in a let's support The Throckmorton Theater mode so while the place was packed (many were there to be seen . . . including our dear Captain) and the died in the wool Dan Fans (including our dear Captain) seemed a minority. Dan wryly mentioned that there is usually an uproar when certain titles are mentioned . . . not always in your Mill Valley . . . . sorry Dan. It seemed there were several of Dan's numbers that were a copacetic fit to the Swing Noir mood yet were conspicuously off the play list . . . how 'bout Level with Me Lauri and Don't Stop the Meter, Mack . . . quite noir. . . Lucy a co-owner of the theater gave me permission to pinch a poster I waited in line at Dan's table in the loby and got Dan and the Lickettes autographs! Don't laugh something like that means a lot to fan . . . you'll never see that poster on ebay, never! The Gala celebration of Charlie Deal artist/guitar maker at "apartment A" was what makes Mill Valley . . . well Mill Valley. My hat is off to Julia Nyman and Steven Bajor for a first class reception and a total party vibe. Apartment A is now on the map and most importantly in the hearts of the community. As taken directly from a BLATANT PLUG: . 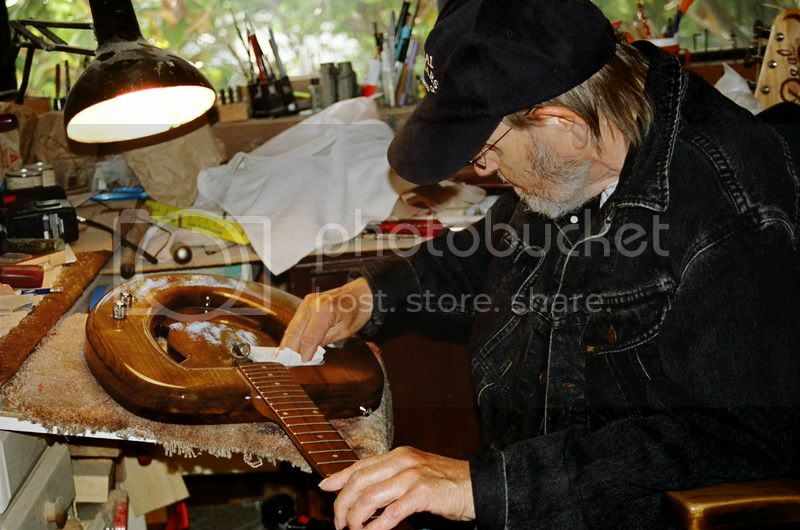 . . Charlie Deal and his legenedary toilet seat guitars at Apartment A ~ OCTOBER 2nd through OCTOBER 9th. The Gala Opening Reception is Saturday * October 2nd 4 - 6 pm. See you there! MEET CHARLIE DEAL in person! 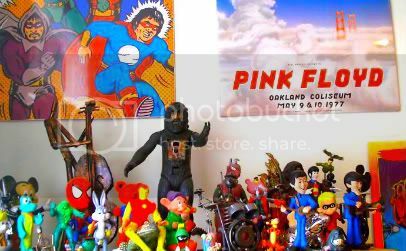 Now tell your well heeled counter parts to frequent "apartment A" and buy some cool art. 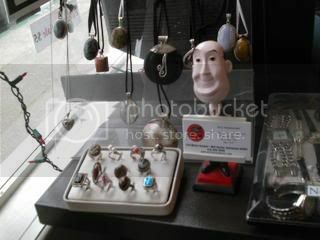 Quite frankly there is no other gift shop as cool with more affordable gifts in all of Mill Valley. I was about to play something on a Toiletcaster guitar when Mr. Dan Hicks walked right in "apartment A". I was humbled and put the toilet seat down imediately (as I was trained to do by my wife years ago). Dan was witty, charming, and friendly to all. We had a chance to talk about the changes in our home town, the jug band, and other stuff. Thanks Julia Nyman for this photo of my dreams. "DUDES IN SHADES" Dan doesn't own a Deal Guitar because he digs and plays acoustic (not breaking news to Hixters?). I'm dealing with star-struck-syndrom aka I'm-not-worthies much better these days in case you wondered. I sure am proud to be in the presence of my musical hero. My heads still reel'n got to briefly talk to Dan and stand close to the radient Naomi! Wow what a babe! Naomi performed an original tune that was smart, polished, ironic, and funny (not bad for one song). The night club like setting of 142 Throckmorton Theater was the perfect venue. Ramblin' Jack and Dan singing Hank (perhaps the finest singer/songwriter of all time, Hank Williams that is . . . Dan and Bob are up there too) was almost too much sic. awesomeness in one night! A Sizzle'n Hot and Squeeky Tight Performance! A more detailed account will likely follow. Sid Page look out! Hix-nics of Cyberspace (anyone who knows this site can attest I couldn't have written a better plug myself) . . . . . I'm already getting great responses from super cool Hix-nics!. . . . .
Let it be known Dan's songs are smart and so are his fans. I am really clear what great people hix people are . . . well I want to invite any of you who will be seeing Hot Licks and Cool Customers to write a review and email it RanchoBozo.com. Check out the natural and organic way your man Dan is represented on the site. Then hear Wendy Lapides (a real Dan fan who wrote great reviews and who I met on this Hix thing) and me I'm Wayne write and perform under the influence of Dan and others. I see Dan all over the place in Beautiful Mill Valley. Please support and visit RanchoBozo.com often it's changing all the time. Well there's something happening in town that's pretty cool; it's on September 11, 2004 a big ralley supporting . . . . not in my Mill Valley. It's a very big event at the 142 Throckmorton Theater the return of the reinvented Hot Licks and Mill Valley's favorite son Mr. Dan Hicks! and that's not all . . . the forever hot chickette and almost original Lickette Naomi Eisenberg . . . . some mystry guests that may or may not show and another legend in his own time the one and only Ramblin' Jack Elliott. I'll be there (as a COOL CUSTOMER) in the audience to round things up or out or somethin'. Well after ducking out three times at the Sweetwater Open Mic the ever elusive Captain Wayne-O performed. I mustered courage and had a game plan. If I could get the audience's attention, make 'em laugh and get 'em on my side - well then maybe they will dig my off key voice and marginal guitar playing and somehow get into my wacky cool lyrics. It worked like a champ! There wasn't a dry throat in the house. Performing arts: I don't know what happens to me when I get on stage. Somehow I'm transformed into some kind of a circus animal. I shake when I'm up there and yet pull off some kind of audience connection that lets me play in public with my terror. I dont know if what I say is funny or how I say it is funny but somehow it is. I surprise myself as I surprise the audience. I'm grateful that for the most part Marin audiences are forgiving and supportive. I might have a different take if I confronted hostility. I dont know where Im going with this. I feel I should get some experience performing since I am getting some notoriety from RanchoBozo.com. Who knows I may be asked to open for somebody or something. So get ready Captain Wayne-O you may be called to duty. Maybe I can get the Grantster of Cyberspace to write a favorable review. For twenty plus years I've loved going to Goodman Building Supply right here in Mill Valley (when they were only thirty years old). My house is held together and beautified with items and lumber from Goodman's. I always thought it would be a dream job to work there. I learned nearly all I know about doing things around the house from the kind, genuine, all if not most knowing, friendly, service first staff. Especially Tommy who retired from running the lumber yard a few years ago. Wow I'm there Friday, Saturday, Sunday, and Monday. Just ask for Wayne-O (I thought I'd drop the 'Captain' bit for the job). I promise to give you great service with a smile. I really love it there! Remember Goodman: "Where the Difference is Service" is far more than just a clever slogan. I havent been on a word processing program since I got involved with RanchoBozo.com. It's a shame 'cause I use to write quite a bit with one. A computer was like a typewriter to me. Word processing was always the central function. I'm going to attempt an insertion from word processing to html. I think itll be a snap. Wow it was! 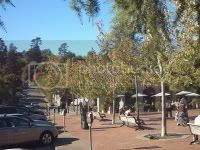 It's amusing to go to down town Mill Valley and check out the scene . . . the same faces . . . new faces. Whats new? Well, I had a great meeting with Alan Nayer. We started with a cup of coffee at the Depot and went on from there. I enjoyed a walk to Old Mill Park and the Cascade area as we learned more about eachother. We found we have similar interests in the environment and wild life. 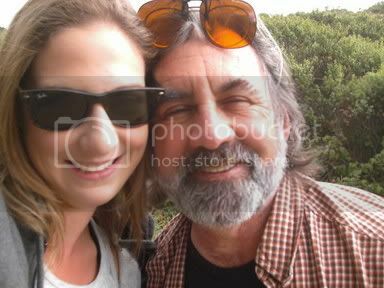 We value our respective wifes and we're coping with retirement in our own cyber ways. It felt good to be appreciated as an artistic writer. I never really considered my style of writing anything more than playful. I'm awed by the scope of MV94941 and Alan's photo-journalistic skills. Before either one of us knew it two hours passed while we exchanged compliments, ideas, and observations. I think we will likely become involved with a project or two in the future. More on this later. . . . There I did it a completely drolless paragraph! Now that Erma and Daniel are concentrating on their venue first Friday just had to go like George said in the title of his triple box set, all things must pass . . . so sad but so true. FIRST FRIDAY (oh, now I guess it's 'Every Other First Friday') at the Murphy Saloon is sound'n better than ever. It's amazing what can be accomplished through talent, community, and practice. I introduced the Grantster to Erma, Daniel, Brent, and the reg-ulars with guitars. I brought my squire tele (unplugged no one bugged), unforunately time and courage ran out for me. As I applied classic sour grape reasoning: I don't think anyone would know the tempo of Suburbian Cowboy anyway . . . and I better practice . . . . What Erma and Daniel do is so cool for Mill Valley and it's rockers! OK here's that cool link I promised you . . . . MurphyProductions.com click and see your friends. Support all Erma and Daniel events and services! Powder to the Peep hole Ratton! 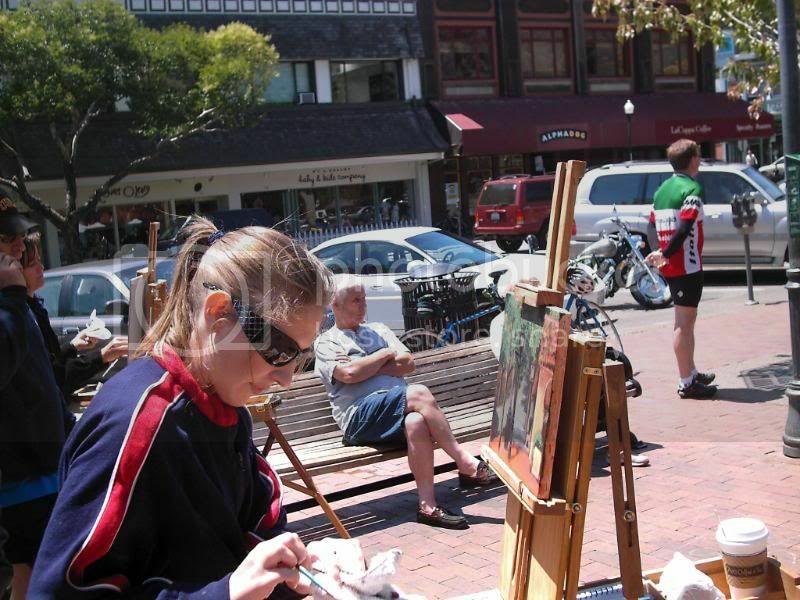 The Mill Valley Art Commission cracked down uptown Mill Valley no no that's not right the Mill Valley Art Commission cracked up downtown Mill Valley on Comedy Day June 22, 2oo4 as proclaimed by Mayor Swanson. Where as . . . The whole town square was doubled over in belly laughs and choking in chuckles! Where as . . . The turn out for levity exceeded all expectations of brevity . . . Where as . . . The generosity of the comedians, their keen wit and penetrating social insights totally tickled the collective funny bone of this fabulous little town in Southern Marin. 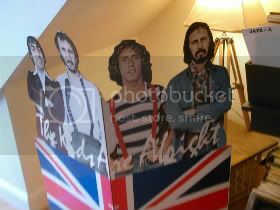 The FUNNY FAB FOUR (as in the Beatles OK) were able to tailor their material to delight a family audience! Wow that's comic genius! The good capt. along with other significant others of the art commmision dined with W.Kamua Bell, Jim Short, Johnny Steele, and Will Durst at D'Angelo's. The comedians are talented, kind, involved, hilarious, creative, intelligent, and generous to a fault all and all just perfect bozos. I felt so lucky to be with top stand up comics at the restaurant I feel most at home in. Thanks for one of the funniest dinners I've ever had experienced and for sure the funniest free dinner (not for Wendy and me) I've ever been to! You'd think we were eating at Cobb's Comedy Club or something! I think you will enjoy linking up with these important humorists! Click on to the comedians above and LISTEN to samples of fantastic original material! 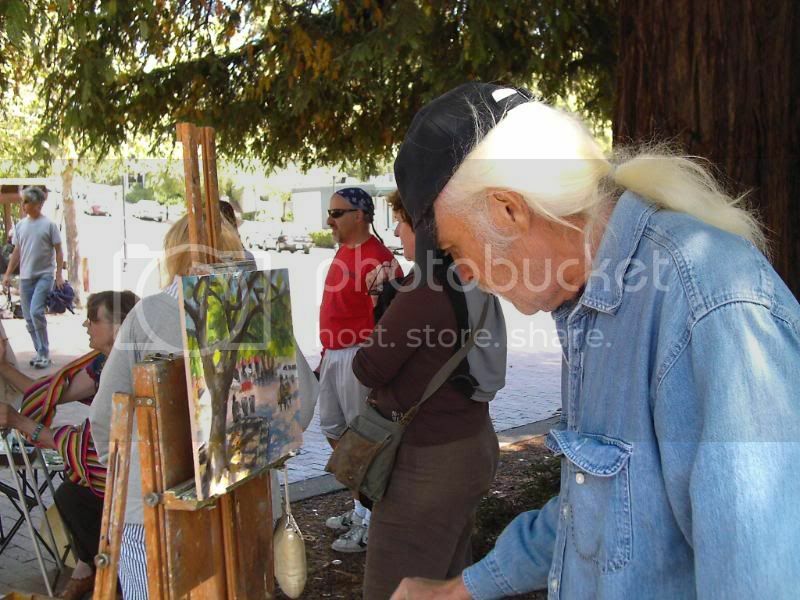 Great pictures and coverage by Alan Nayer of MillValley94941.com. Scroll down to Comedy in the Plaza. Alan Nayer and Captain Wayne-O meet at last! This is going to be community page like . . . a what's going on around town kind of perspective of someone who's pretty much out of the loop. 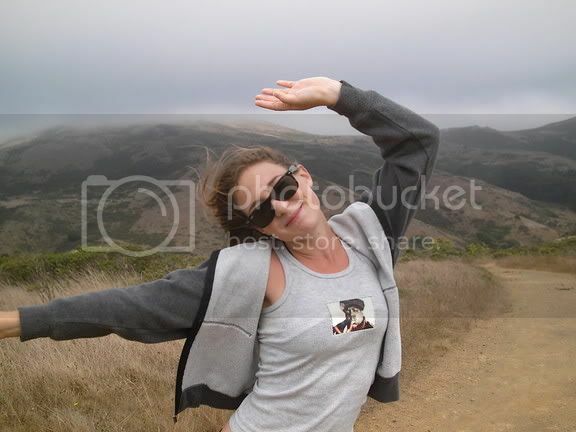 I'll move Mill Valley excursions and stuff like that on this page. I've not abandoned the Road to Katmandu "cyber back pack" notion. That's still in the works. 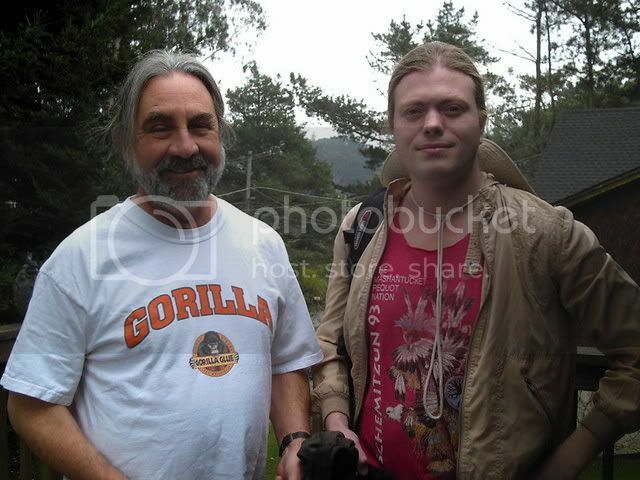 Way back when RanchoBozo.com was but a few weeks old I was walking around downtown Mill Valley (it seems like just the other day) and stopped by one of my favorite stores Two Neat to chat with Bob, buy a goofy card, a 'Don't Look Back' DVD, and plug my web site. 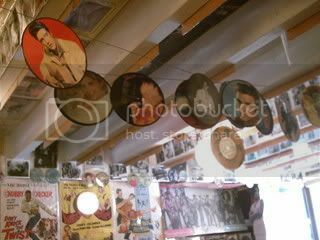 I walked up past our movie house to Village Music to check out what was new in the fifty cent bin, losing myself amongst the most amazing collection of recorded music I have ever seen (I had not at that point been to the Smithsonian). I asked John if I could link to his site. Take heed all you spammers the good Capt. Wayne-O asks first! John was cool (of course he invented cool) and said sure. I bought a CAKE CD for Webmaster Grants' Bday. 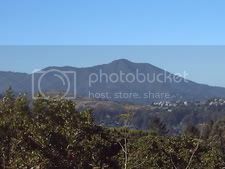 I would like to thank Alan of MillValley94941.com for his prompt and supportive response; thanks for giving us Mill Valley's most comprehensive website! 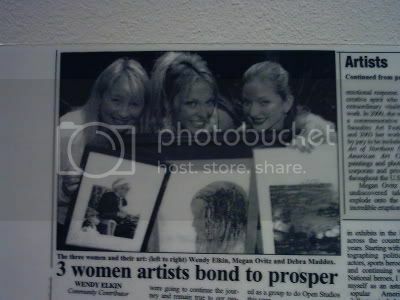 April 27 2004, The Mill Valley Herald tells all 'three blondes bonded by the arts . . .' read all about it! Dan so far I haven't made penny off your images but the day I do I'm running to the bank to send you your fair share, really man I believe in that kinda stuff. Up hiway 1 up the road a couple of miles past Rancho Bozo de Norte is Green Gultch Farm, a Zen Center and working farm . . . it is a favorite place for hikes . . . the Canadian Princess took this little film of me as I summon the faithful . . .